Businesses of all sizes are increasingly threatened by a variety of cyberattacks. This is especially true for law firms, since they have access to highly confidential information related to clients, investigators, witnesses, and other parties. 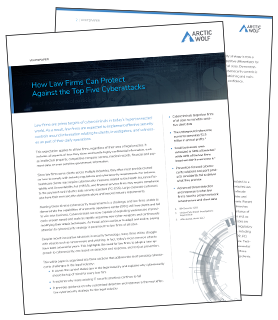 In this white paper, you’ll learn about the most common forms of cyberattacks and what law firms can do to protect themselves. For organizations seeking a security operations center, Arctic Wolf’s AWN CyberSOC™ is the perfect solution. To do the equivalent internally would have cost us far more and taken many months. AWN’s Concierge Security Engineer™ acts as extension of our IT team and provides a level of service that can only be described as incredible.